If you are like most people your home is one of your largest assets, and it will take some preparation to ensure your house is ready to sell for top dollar. Potential buyers need to feel comfortable in your home and see the potential to make it their own. Looking at your home with a fresh set of eyes can go a long way towards making the small changes needed to maximize your selling and profit potential. While a professional home stager would be an ideal candidate to offer suggestions, their services can be expensive. Consider asking a trusted friend or neighbor to walk through your home and advise on what to change to appeal to a potential buyer. There’s a good chance the prospective homeowner already used a mortgage calculator to determine their maximum budget, so if they are looking at your home they are most likely a serious buyer. Be sure your house is ready to sell before the for sale sign is staked in your yard. 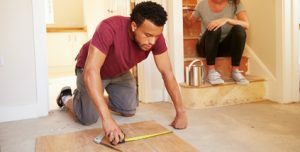 In the meantime, here are a few inexpensive things you can do to get your home up to par ready and ready to compete in today’s real estate market. Never underestimate the importance of the first impression of your home. Your home’s curb appeal (the way it looks from the street) will be a major determination of whether the inside of your home gets a first look. Start with your front door. Consider applying a new stain or a fresh coat of paint to a weather-worn door. Don’t be afraid to try a bold new color as long as it compliments your house. Next look at the yard. Does it need some sprucing up? Take time to weed all beds, plant some annuals and trim overgrown shrubs and trees. While you are at it, make sure to do the same to the back yard. A few yards of mulch or bark in highly visible flower beds will give a fresh look to your planter areas. Make sure any tools, bikes, or outdoor equipment is cleared and neatly organized in storage or in the garage. Before placing your home on the market, tackle all the items in your home that are taking up your energy and limiting your space. Start with your closets. Organize every closet, and donate clothes, shoes and other items your family hasn’t worn or used in the past year. Next, get rid of all the excess product and accessories in the bathroom cabinets, organizing any items you wish to keep. Go through your children’s dressers and drawers and store off season items in containers, while donating everything you don’t want to follow you to your next home. Sort through and file the paperwork on kitchen counters, bedroom nightstands, and the desk in the home office. An organized home is appealing and worth the time to make it happen. Whatever you do, don’t forget the garage. Like it or not, the garage is a selling point of your home and any unkept space can leave a poor impression on a potential buyer. Throw out any garbage and clutter collecting in your garage, and hang yard or workshop tools on the walls. Store sports equipment in bins on garage shelving. Make sure the floor is swept and the garage is well lit. Don’t neglect to tidy up your garage before showing your home. One of most inexpensive ways to add value to your home is to give the inside a fresh coat of paint. Touching up all doors, trim, and baseboards will go a long way in giving buyers a great impression of your home. Repaint any rooms that are not neutral in color, so that buyers can imagine their furniture and style in your home. Using light neutral colors will brighten and freshen up your home and create an easy transition and flow between rooms. No matter the season, getting your home ready to sell requires a detailed spring cleaning. Start with your rugs and carpets. If you can’t hire a professional, consider buying an upright carpet cleaner (you can find many under $200) and give your carpets a good cleaning. Make sure all your tile, wood, or laminate flooring is clean and in decent shape. Give your cupboards and cabinets a thorough wipe down and take a hot soapy cloth to your light switch and socket covers. Clean all inside and outside windows and decorative and bathroom mirrors, and dust your furniture, shelving, and banisters. When the deep cleaning is done, make sure to keep your home tidy and free from clutter so you can be ready to show your home at any time. Looking at your home through the eyes of a prospective buyer can help you determine what furniture might need to be stored, what pictures need to come down, and what accessories can be added. While you would never envision your home without the family photos covering the walls in your hallway, or your child’s artwork showcased on the refrigerator doors, think of the prospective buyer. They are looking for a house that will become their home and chances are, their style may be quite a bit different from yours. Part of redecorating will be depersonalizing your home, at least to some degree. It also will include storing any excess furniture, while staging your home with the best pieces to showcase your floor plan. When showing your home, lighting is everything. Maximize your windows to draw the most natural light possible into your home. Toss worn blinds and replace them with light curtains. Lamps placed in the right place will go along way to lighten up dark rooms, especially those in the basement. Lightly scented candles placed in a few of the bathrooms and the kitchen can create both a nice scent and the perfect ambiance for potential buyers. Depending on the season, a vase of fresh summer blooms, fall twigs and berries, or a winter evergreen wreath can add the perfect finishing touch. Remember that when you put your home on the market you have entered a competition of sorts. You will want your home to stand out from the others in the same housing market. A little cash and some elbow grease will go a long way in protecting your investment and maximizing your home’s selling price. What are some inexpensive tricks you have used to get your house ready to sell?